The wife and I always have reservations about Cluster/Strata-Titled housing projects. This is primarily because of the very small “built-in area” per floor that is usually associated with cluster houses. However, buoyed by renewed confidence in such project after seeing ‘The Luxus” (Ang Mo Kio) and “The Greenwood” (Bukit Timah) a few months ago, i.e. before we started this blog, the wife and I decided to take a gamble on ESTRIVILLAS. ESTRIVILLAS is a 39-units freehold cluster housing project located at Jalan Lim Tai See. The development resides on a 61,000sqft plot, and consists of 38 semi-detached houses and 1 bungalow. With the semi-detached houses, you have a choice of either 2½-storey (10 in total: 59A-K) or 3½-storey (28 in total: 55A-J, 57 & 57A-J) units. 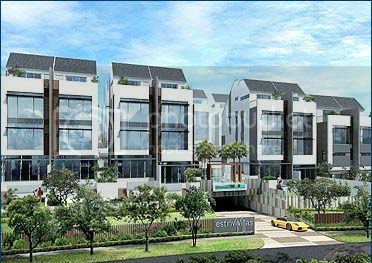 ESTRIVILLAS is developed by Fortune Land Pte Ltd – a developer that we (pardon our ignorance) have never heard of. But our Web search shows that they also developed the “Dunsfold 18” cluster houses in Bradell. The expected TOP for this project is mid – end 2013. The project is not big on facilities, which is typical of most cluster housing. All you get is 2 carpark lots per unit in the basement and swimming pools. No visitors’ lot is available, so your guests will have to take their chances on roadside parking along Jalan Lim Tai See, which is a rather narrow road to begin with. The sales gallery is located at the actual site itself. The first question the wife and I had in our minds when we arrived at the site was: how are they going to fit 39 houses that are supposedly between 4,300 – 7600sqft each and the swimming pools into such a small plot of land? There was no showflat of the actual house available for viewing – what you get is a representation of the floor space that houses the living/dinning room and kitchen, as well as the mater bedroom level. • Basement: A guest room, family room, bathroom and maid’s quarter (with own bathroom). The two carpark lots are just outside your basement. • Second Floor: Junior Suite and two bedrooms (shared bathroom). A powder room on the first – second storey staircase landing. • Second Floor: Master bedroom, and a powder room on the first – second storey staircase landing. • Third Floor: Two en-suite bedrooms. The typical floor size is between 500 – 600sqft for all units within ESTRAVILLAS, which seemed rather small especially when you need to fit in 3 bedrooms in the 2½-storey unit all within one floor. All houses come with 3m high ceiling on each floor, marble flooring for the living/dining room and even kitchen, “Gaggenau” kitchen appliances and “Grohe” bathroom fittings. The master bedroom is spacious enough to accommodate a study and comes with a walk-in closet – the space is understandable since it occupies the whole floor on its own. • Location – ESTRIVILLAS is located within the prime Holland/Sixth Ave area. So you be living among landed property and private condo dwellers, which is pleasing to folks with “heartland living” phobias. It is within minutes from amenities in Sixth Ave and Holland Village. The area is also popular with the expat community so rental demand is expected to be strong. • Location – This sounds like a contradiction, but Jalan Lim Tai See is located quite far from the main Sixth Ave or Holland Road. So it can be quite a far walk to that bus-stop if you have nothing left for taxi fare or car purchase after you spent all that money on the house. • As per many cluster housing, the main door of each unit is actually in the basement, i.e. you park your car(s) in front of your unit and then enter via the door next to you. And for most units in ESTRIVILLAS, guest will either have to walk through your basement carpark to visit your unit, or access your unit from a back gate behind your house. The back gate will either lead you through the kitchen before hitting the living room, or you can enter via a side door located on one side of your living room. There is no real “main door” to speak on the ground level, as the front of most units extends out to the swimming pools via the pool deck. The wife claimed that such design, i.e. no proper “main door” on the ground level of a house, is rather bad Feng Shui wise. • Although surrounded by “premier” primary schools such as Henry Park Primary, Nanyang Primary and RGPS, none of these are within 1-km of ESTRIVILLAS. We were told by the marketing agent that our best bet is Henry Park, which the developer “claimed” is 0.95km away but they are not absolutely sure. So it is best to check with the school or MOE to confirm. Now for the biggest discovery of this visit: If you take a typical 2½-storey house in ESTRIVILLAS, this is about 5,000sqft. However, we asked and were told that each floor is around 500 – 600sqft. Even if we err on the higher end, the total built in area is at best 2,400sqft. So whatever happened to the remaining 2,600sqft? The marketing agent explained that the 5,000sqft that you pay is based on “Strata Area”, and if you take in the aircon ledge, the strata void and rooftop area - since this is where the water tank resides, it is considered your area and thus you have to pay for it - the total built in area is more like 3,300sqft. However, this still leaves quite a discrepancy from the 5,000sqft house you are paying for. An ensuing “discussion” followed between the wife and the two marketing agents attending to us, and being the righteous “don’t you dare take me for a ride” type of person that she is (bless her heart), the conversation was heating up to the point where someone might get seriously hurt. And if you are acquainted with the wife, you know the one getting hurt will NOT be her! But what surfaced from the whole episode is we now know where the “discrepancy in area” lies. Under the “Strata Area” method of calculating the size of your cluster house, the developer takes all common area, i.e. the walkways and open grounds within the estate, the land that the swimming pools and other facilities take up, the whole basement carpark area etc and apportions these to each of the unit owners. So the balance 1,700 of the 5,000sqft house is YOUR share of the common area. This is a whole different concept compared with what we are normally used to for condominium projects, where the actual size is based purely on your unit’s built-in area. More importantly, we come to realize that for any cluster housing project that is marketed using “Strata Area”, the actual psf price may be way higher than the perceived psf. As an illustration: The price quoted to us for one of the 2½-storey unit (59B), which has a Strata Area of 5,307sqft, is around $3.63million nett. This equates to a “perceived” price of around $684psf. Even if we agree with the agent’s explanation about what constitutes the “built in” area – which they claimed is 3,300sqft, you are actually paying around $1,100psf for your 2½-storey cluster house. And given the price norm of $500 – 800psf (“built in” basis) for typical cluster housing projects, ESTRIVILLAS tops the mark for being the most expensive in our books. And if our memories serve us right, ESTRIVILLAS is the only cluster development we have seen so far that sells on such (Strata Area) method of calculation for unit size. This is despite the repeated reassurance from the agent that this is a common sales basis for cluster housing projects. In summary, the wife and I left ESTRIVILLAS feeling rather disappointed as we actually expected to see a “much larger area per floor” house given the size of the unit (4,300 – 7,600) advertised. But we did learn something new so it is not a wasted trip altogether. 2 comments to ''ESTRIVILLAS - Cluster House (Review)"
Wow, the strata area way of calculating, sounds like how Hong Kong developers calculate square footage as well.